Sebum is secreted naturally to lubricate and waterproof the skin and hair, but if excess sebum and dead skin cells are allowed to build up on the surface of the scalp, this can clog the hair follicles, and may contribute to hair loss. This build-up can also form an effective barrier to the absorption of Minoxidil at the dermal papilla level. 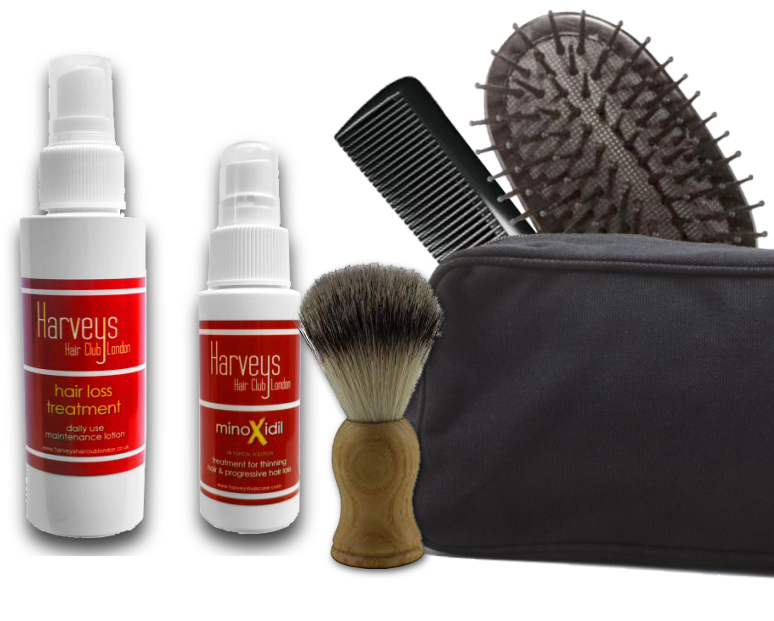 Harveys Anti-hair loss Treatment, prepares the root area of the hair to be more receptive to Minoxidil. Cleaning and preparing the path to the hair root allows the Minoxidil to come into contact with the root where it is needed. Harveys Minoxidil is a 5% topical solution containing Minoxidil which acts on the scalp to help hair growth in balding areas, acting in a similar way to Regaine®. It can be used to treat hair loss related to age or family history. Re-growth of hair may be seen between 2-4 months, and regular use is required to keep the new hair growth. Trials of 5% Minoxidil concluded that it was very effective in 15.9% of patients, effective in 47.8% of patients & moderately effective in 20.6% of patients. Available either as a single 60ml spray, or in a Travel Pack with our Anti-hair poss treatment. Lotion for thinning and falling hair, designed to maintain the natural equilibrium of hair & scalp. Particularly suitable as an anti-dandruff and excess sebum treatment, often connected with hair loss. When used regularly, it has been shown to arrest or substantially reduce excessive hair loss. It also helps to prevent dandruff and to slow down its formation, combats itching & leaves a sensation of freshness.